MARQUETTE — Northern Michigan University forwards Joseph Nardi and Griffin Loughran may not get the attention and the accolades of their teammates, but they were the Wildcats’ two stars Friday night in Game 1 of their best-of-three playoff series against Alaska-Fairbanks. With the game tied midway through the second overtime, Loughran veered his way around the back of the Alaska net and sent a pass across the crease to Nardi, who sent it past Nanooks goalie Anton Martinsson and gave the Wildcats a thrilling 5-4 win. Nardi finished with two goals and an assist, while Loughran had a goal and two assists. “I think we just know where each other are on the ice,” Nardi said. “We’re gritty players and like to get in the corners and obviously work hard to get back the puck. I think when both of us are working hard, we’re generating opportunities. The interesting thing about Nardi and Loughran is that the coaching staff was considering breaking their line up this week, but ultimately chose not to and it paid off. 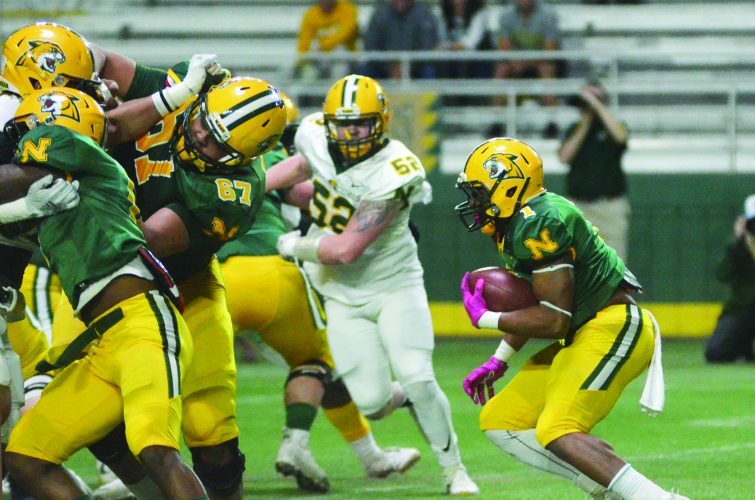 “That was a huge game for them,” NMU head coach Grant Potulny said. “We actually kind of talked about splitting them up this week to see if we could create a little more depth scoring and we decided against it. “(NMU assistant coach) Rob (Lehtinen) met with the three of them and showed them video and kind of walked them through. They were just missing the net a little bit and not bearing down on some chances. They weren’t off by much, and tonight they dialed the scope. The first OT period was controlled primarily by the Wildcats, but it was the Nanooks that got the better scoring chances. With 11 minutes remaining, NMU goalie Atte Tolvanen made a nice save to stop a wraparound attempt by Steven Jandric and then flashed his glove to stop Chris Jandric’s shot from the point. Tolvanen came up big again with five minutes left. After Alaska’s Chad Staley collected a loose puck in the crease, Tolvanen kicked his leg out and kept the puck out with the tip of his skate. The rebound went right to another Nanook forward and the senior netminder deflected it into the netting with his glove. 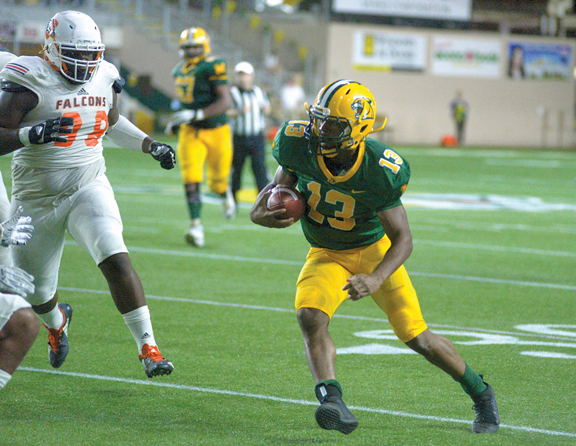 The Nanooks kept NMU’s offense at bay for the most part and killed off two penalties. The Wildcats’ lone opportunity came on their second power play of the period as Troy Loggins weaved up the middle of the Alaska defensive zone, sent a pass through the legs of a Nanooks defenseman and corralled it again before Martinsson made the save. Things looked bleak for NMU in the third period after they gave up three unanswered goals to the Nanooks a period earlier. However, the Wildcats kept fighting and caught a break five minutes into the period. After drawing a hooking penalty on Alaska, Loughran got a feed from Nardi from the near post and one-timed it past Martinsson. Northern almost tied it moments later, but Martinsson made a sliding save on a shot by Darien Craighead. In desperation mode with two minutes left, Tolvanen was pulled for the extra attacker and with 14 seconds to go, the move paid off. Defenseman Phil Beaulieu sent a shot on net that was saved by Martinsson and then he denied Craighead on the rebound. He couldn’t collect the second rebound, though, as Rockwood tapped it into the open net. After two officials’ reviews, the goal eventually counted to send the game to overtime. When asked what he felt like after his goal, Rockwood took a breath and said he felt relieved. Potulny said the goal gave his team an emotional boost, but also said that sometimes when a goal like that happens, it can make a team too comfortable and they stop attacking. “The one thing that I said to them was, if you’ve been around the game long enough, it’s funny because the team that scores that goal a lot, they take their foot off the gas,” he said. “All of a sudden, they don’t complete the victory. The second period started great for Northern. Trailing 1-0, the Wildcats got on the board a little over two minutes in. On a rush, Loughran backhanded a pass over to Nardi, who beat Martinsson to the far post to tie it. A little over a minute later, the Wildcats struck again. Northern defenseman Connor Frantti fired a shot from the point that went off Martinsson’s shoulder and fell to the crease. Forward Vincent De Mey then tapped the rebound into the open net and the Wildcats took the lead. But it didn’t last. Midway through the period, Alaska began generating scoring chances. With 9:30 left, the Nanooks cashed in as Kyle Marino collected the puck during a scrum in the crease and beat a sprawling Tolvanen to the far post. Two minutes later, Alaska took the lead as Steven Jandric’s shot from the point was saved by Tolvanen, but he bobbled it and it went off his skate and into the back of the net. The Nanooks weren’t done as they caught the Wildcats napping and raced up the ice with four minutes remaining in the period. On the rush, Kylar Hope passed it over to fellow forward Chase Ellingson, who beat a confused Tolvanen to give Alaska a 4-2 advantage after two. NMU started putting pressure on the Alaska defense early in the first period as Nardi and Grant Loven both had decent looks at the net in the first three minutes. Forward Troy Loggins also had a golden chance with the Wildcats on the power play as he got a pass from Rockwood for a one-timer, but a Nanooks defenseman just got a piece of it with his stick to deflect it wide. Loggins got another chance with about 10 minutes left, this time with Northern on the penalty kill. The senior got a pass near center ice and weaved his way through the Alaska defense and snapped a shot on net by the near post, but Martinsson knocked it aside. 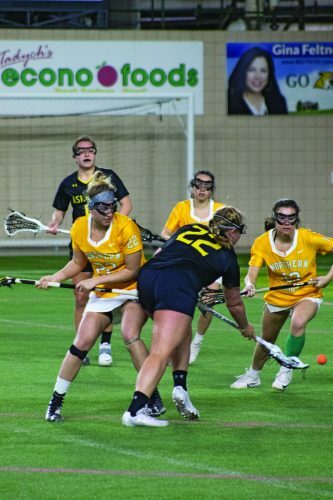 NMU’s next quality scoring opportunity also came on the kill. Beaulieu raced up the far boards and fed a pass over to Nardi at the near post, but instead of shooting, Nardi passes it to Loughran in the slot and Martinsson stuffed the play. After being held in check for the majority of the period, Alaska got on the board with 3:22 remaining when the Nanooks caught the Wildcats napping. UAF forward Tyler Cline got a pass from behind the net in the high slot and had a clear look before sending a shot at Tolvanen that deflected over his shoulder and in to put the Nanooks up 1-0. Looking ahead to tonight’s Game 2, Rockwood said that the Wildcats need to be prepared for a fight because it’s not going to be an easy task to end a team’s season, something they learned last year in their series against Alabama-Huntsville. “That’s a team that just works their tails off. They gave us some fits tonight, so we have to appreciate their game more.